In 1871, Alfred Richard Cecil Selwyn (1824-1902), then Director of the Geological Survey of Canada, made a journey from Kamloops to Tête Jaune Cache, and ascended the Fraser River some distance above Moose Lake. Selwyn accompanied railway engineer Roderick McLennan on his survey of the Yellowhead Pass, coming along to study the strata of the area. Selwyn made careful notes of the geology in his field book until, somewhere in the Albreda Pass, his horse ate the book. In 1875 Selwyn did field work for the Canadian Geological Survey on the Fraser and Peace Rivers. Selwyn was born at Somerset, England. He was privately educated, and became assistant geologist on the staff of the Geological Survey of Great Britian. From 1852 to 1869 he was director of the Geological Survey of Victoria, Australia. 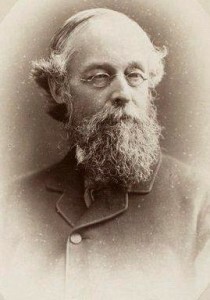 From 1869 until his retirement in 1895 he was director of the Geological Survey of Canada. In 1852 he married Matilda. He was a fellow of the Royal Society, of the Geographical Society, and of the Royal Society of Canada, of which he was president in 1896. He died at Victoria, British Columbia.